"The Most Shocking American History Story That You Will Ever Read"
Rebuke and Forever Silence is one of the most incredible stories that you will ever read. 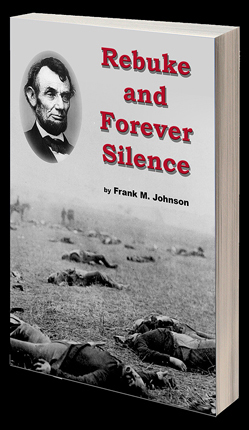 Although the story focuses on President Abraham Lincoln and the Republican Party, this book reveals that the true causes of the War Between the States began with the earliest Colonies in America and erupted into brutal hatred during the Constitutional Convention in 1787 through 1789. The title of the book comes from a resolution in the 1860 Republican Party Platform that stated: "it is the imperative duty of an indignant people sternly to rebuke and forever silence" those who spoke of disunion. Few Americans realize that both President Lincoln and his Republican party defended slavery where it existed and that there was no threat to slavery in the Southern States. This raises the question - "if the Republicans so staunchly defended slavery where it existed then why were they so adamantly opposed to the introduction of slaves in the new territories." In Lincoln's own words: "Those lands were meant for White People." Copyright © 2017 by Frank M. Johnson. All rights reserved.